Set of table and stools designed by Charlotte Perriand for Les Arcs ski Resort circa 1960, manufactured in France. Pinewood. In original condition, with minor wear consistent with age and use, preserving a beautiful patina. 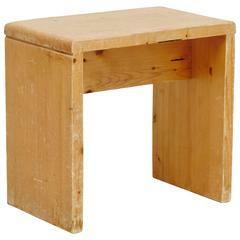 Measure: Table 80 W x 67.5 D x 71 H cm Stools (Each) 45 W x 30 D x 42 H cm. Charlotte Perriand (1903-1999) She was born in Paris in 1903 and attended the E´cole de l'Union centrale des Arts de´coratifs from 1920 to 1925. Charlotte Perriand designed furniture made of anodized aluminium and chromium-plated steel, showing it at the 1927 "Salon d'Automne" in Paris. After meeting Le Corbusier, Charlotte Perriand worked with him and Pierre Jeanneret until 1937. The revolutionary tubular steel furnishings and system furniture designed by the three were presented as "E´quipement de l'habitation" (home equipment) at the 1929 "Salon d'Automne", where they were widely acclaimed. In 1930 the Union Des Artistes Modernes (UAM) was founded in Paris, a group that viewed itself as a countermovement challenging such establishment organizations as the "Salon d'Automne" and also advocated Art de´co and Modernism. From 1931 Charlotte Perriand showed her own work solo there. In 1937 Charlotte Perriand and Pierre Jeanneret collaborated on designing a mountain chalet of sheet aluminium, which they showed at the "Exposition Internationale des Arts et Techniques dans la Vie Moderne" and later they came up with plans for prefab houses made of aluminium. In 1940 Charlotte Perriand became a design consultant to the Japanese Board of Trade. She lived in Japan until 1946 and from then on Charlotte Perriand's designs reveal overtones of the Japanese feeling for form, as shown by the 1953 chair "Synthe`se des Arts.". Occasional - cafe table designed by Charlotte Perriand for Les Arcs France, circa 1960s wood + metal Measures: 25 15/16” H x 27 7/16” W x 16 5/8” D.
Dining table Part of a dining table set Designed by Charlotte Perriand for Les Arcs France, circa 1968. Pine Measures: 27 ¾” H x 61 ?” W x 26 ?” D.